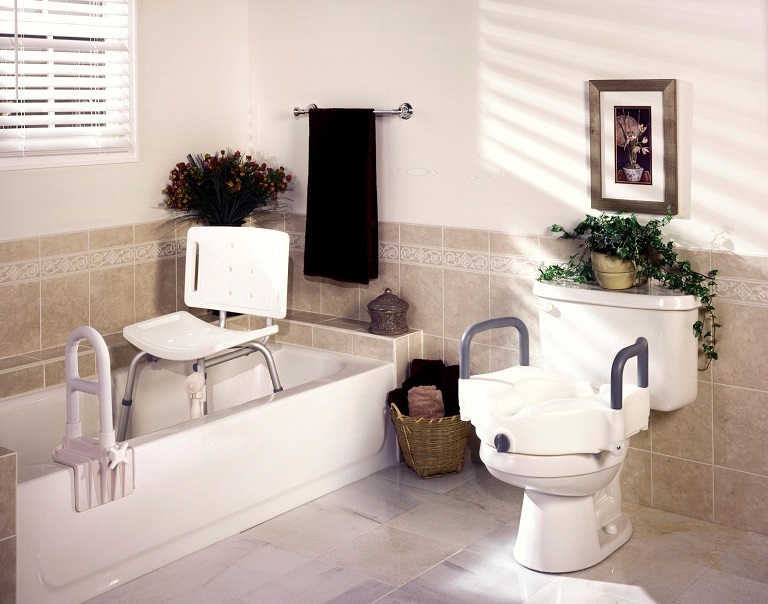 For a person with any kind of disability, whether caused by an accident, sickness, or age related, the bathroom can be one of the most dangerous areas of the house. As a matter of fact, 2/3 emergency room visits made by disabled people have been caused by bathroom falls and accidents. Because using this room presents many access challenges, a number of adjustments need to be done in order to make the experience easier and safer. Most people think that making a bathroom accessible demands a complete and expensive redesign, however even small changes can make quite a difference. Here are some simple steps you can take to prevent bathroom accidents and increase the independence of the person using it. 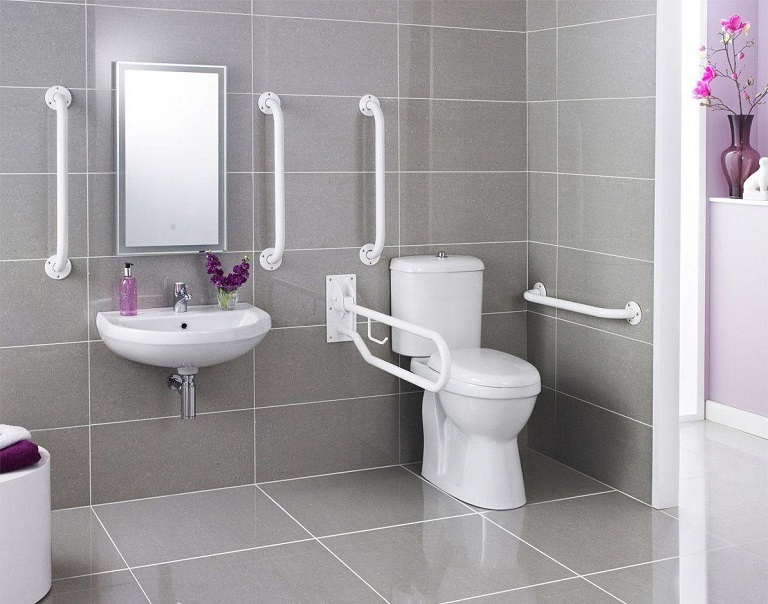 Grab rails are the most inexpensive but important type of bathroom equipment for disabled. They are installed on the walls and act as support bars, allowing the person to move freely and safely, not only in the bathroom but all across the house. In the bathroom, grab rails are used to provide steadying support when sitting down, to push or pull yourself up, or to provide balancing support when walking, washing, or bathing. All bathing zones should have grab bars that can take some weight off from the caretaker, and in some cases even allow the the person to take a bath all by himself. If the bathroom has a tub, two rails should be placed on the wall at standing and sitting range. Roll-in or transfer showers, on the other hand, should have grab rails on all walls, both at sitting and standing range. If you can, try to install the controls near the rails so that you can operate the shower easier. Many guideline recommendations for bathroom equipment for disabled say that the toilet bowl should be at least 48 cm high without the toilet seat. A toilet seat positioned higher makes it easier to transfer from and to a wheelchair and to lower or stand if you’re using a walker. Grab rails on both sides of the toilet are a must. The things a person might need the most should be placed in close range, such as toilet paper, wipes, sanitary products and medical equipment. Alternatively, instead of rails you can use a toilet surround that has an easy push button for adjusting the height for changing needs. And if the toilet is much lower than the preferred 48 cm, the height can be easily altered with a special toilet seat raiser, preferably one with different height versions to suit individual requirements. As far as washing is concerned, if the person is immobile from the waist down, the most common change one needs to make is to reposition the sink to fit the height of the person sitting in a wheelchair. There should be no cabinet underneath the sink, as to provide open space for both sitting and standing users. The sink can be made further accessible by installing specialized taps that do not require having to grab or twist and can be easily turned on. Placing low drawers on the side of the sink can provide storage space for the much needed cleaning products. We’ve already briefly mentioned bathing areas, saying that they should be equipped with grab rails. However, it’s also important to consider how a person will enter the bathing area. Walk-in tubs are perhaps most convenient because the user can access the tub without climbing over. If the person isn’t able to stand, a shower stool or bath chair with adjustable height and non-slip legs can facilitate bathing.